Used Juniper MX5 routers serve as the baseline for the MX Series. The MX5 is best suited for enterprise and service provider networking applications. It’s small size makes it ideal for facilities with limited hardware space. Although the MX5 is limited in terms of port configurations and density, it’s a more cost-effective solution than other MX Series routers that have similar specifications. The MX5 is equipped with the most basic specifications of all used Juniper MX Series routers, although it shares a few features with higher-performing MX Series routers. It’s 2 rack units (RU) in size, and is designed as a fixed-configuration router. The MX5 router includes three Modular Interface Card (MIC) slots, which allow port configurations to be customized. There are two slots on the front and one on the back, but only one of the front slots is accessible without upgrading the router. The slot on the back is dedicated to a Multiservices MIC (MS-MIC), which handles the processing for specific services. The MX5 supports up to 1G Ethernet – without any upgrades – and has a maximum capacity of 40 Gbps. Below is a chart that compares several specifications of pre-owned Juniper MX5 routers to other Juniper routers that are designed as fixed-configuration devices, including the MX10, the MX80, the MX104, the MX150 and the MX204. At BrightStar Systems, we also can provide PDF datasheets that dive further into the specifications of pre-owned Juniper fixed-configuration routers, in addition to other used Juniper MX Series routers. Please reach out to our sales team if you’re interested in reviewing more detailed information on MX Series routers. At BrightStar Systems, we will ensure you receive the best price for all used MX Series routers you are looking to sell, whether you’re a large-scale enterprise, a service provider or an individual. We also do bulk purchases if you’re planning to replace all your existing equipment or completely overhaul your network hardware. Selling your pre-owned Juniper MX5 routers is the best way to turn your used Juniper equipment into a financial asset for your operation. Not only do we offer top dollar for pre-owned MX5 routers, we also cover all the shipping costs of getting your hardware to us. Whether you’re shipping equipment domestically or internationally, we’ll take care of it for you; all you have to do is package it and send it. To learn more about BrightStar Systems buying process, or if you would like us to send you a quote for your used surplus MX5 routers, please contact our sales team. 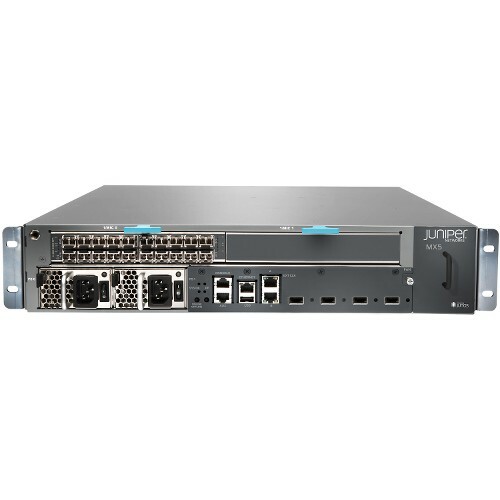 We carry a large inventory of used Juniper equipment, which allows us to sell our in-stock pre-owned MX5 routers at discount prices. It doesn’t matter where you’re located; we have the ability to ship used surplus Juniper MX5 routers anywhere in the world. All our shipments are done using the best materials to ensure your order arrives safe and secure, and ready to go right out of the box. We also sell used Juniper MX5 routers in bulk at special rates, which will save you money in the long run if you’re looking to scale your operation. If you’re in need up upgrading existing pre-owned Juniper MX5 routers, we also have in-stock parts for sale that will keep your equipment running until you’re ready to replace it. For more information about our sales process, please contact us. One of our team members can assist you from start to finish. BrightStar Systems uses a flexible price model for all purchases and sells. This allows us to offer you the best prices for your used equipment and great deals on our in-stock MX5 routers. All we ask is that you provide us with a detailed list that includes all the hardware you want to buy or sell, and we will quickly respond with our offer or quote. For anything you sell us, we can pay you in advance electronically or send a check once we’ve verified the equipment is in working condition. By purchasing from BrightStar, you’ll not only receive reliable, high-performance pre-owned Juniper MX5 routers at the best prices available, but you’ll also reap the benefits of working with an experienced vendor that knows the industry inside and out. Once your order arrives, our team can provide guidance on setup and installation procedures and provide additional resources to help you get your new equipment up and running as soon as possible. Not only that, but all our hardware comes with a 1-Year In-House Warranty, so you won’t have to worry about expenses for repairs for an entire year following your purchase. If you would like to talk to one of our sales associates about selling or purchasing used Juniper MX5 routers, please contact us today. Read more about Juniper MX5 specs with the suggested downloadable PDF datasheet. Contact us today about pre-owned MX 5 routers and ask about our BrightStar Systems’ 1-Year In-House Warranty.